The way charges work with Deterrence, the cooldown seems very similar to 5.3 until you try to use Deterrence a fourth time. Then each time you want it, it's an extra minute or two. There wont be Readiness to finesse through the issue. This isn't hard, but the mechanics aren't too forgiving. Play with your sound on. You're given instructions. All your gear gets scaled down. Waaaay down. The mobs don't damage you at all, but you can't stand idle. I want to try the tanking one as a hunter, but I imagine it will be tough. There have been a whole slew of changes to hunters for 5.4. We got a new Stampede in PvE as a dps cooldown. And some shots got a buff. So our overall damage may be the same or up or down. It's still TBD. But our defensive bonuses that could be helped with Readiness are a bit hosed. We get a lot less Deterrences even though there's a charge (our CD will be a full minute longer). We have a lower CD on Disengage which is great, but can't chain them. There are many offensive bonuses from Readiness. Murder of Crows is getting buffed +40% damage, but you can't readiness with it. (Really the CD and focus cost should just be reduced.) Overall MoCs looks like a wash. (Some call it a nerf but it really depends on how long the fight is and how long the boss is at less than 20%.) That said, Lynx Rush is at the same talent choice level as MoCs and it didn't get any damage buff. It was already behind, so I don't see it ever being taken without some sort of change to it. Back to back Rapid Fires need to be balanced in the add-extra-damage review. I had expected them to add to the duration and/or cut from the cooldown. But there was no change there. There are other short-falls from removing Readiness. There are many 15 and 30 second cooldown abilities that you could hit, readiness, and recycle through immediately for burst. Another loss is Exhilaration. It needs a buff right now, but without Readiness it can't be used twice. Master's Call isn't reset-able. And of course one of the biggest losses for PvP is no more Bestial Wrath. I don't miss Readiness. But I do think many of these other abilities should be adjusted with charges, longer durations, and/or shorter cooldowns. I really wish I knew what these major glyphs are supposed to do. Their descriptions make them seem completely worthless, but yet they shouldn't be since they are our new major glyphs. Glyph of Enduring Deceit. While we're camouflaged, we take 10% less spell damage. That might be nice, and I might not grasp the finer points here. But. But... don't we fall out of camouflage when we take damage... and can we enter camo while in combat? I honestly don't recall since it is far less a PvE ability. But if we can't, then it would mean we'd never get advantage from it in PvE and in PvP it would help with one AoE spell (since we can't be directly targeted) and really it would just be one tick of AoE which would be quite light anyway. So... uh. What is this major glyph supposed to do for us? Glyph of the Lean Pack. Umm. We have a personal-only pack and a large pack. And we can glyph it to make it larger, via a minor glyph. What purpose is this major glyph? If it really is incredibly situational, what's the situation? The best people can come up with is for PvP when you want to move a small group fast but not stun others. But there are a whole bunch of actually good major PvP glyphs that would make this absurd to use. The current state of Hunter aspects is meager. There is not a clear need for them. We have our Hawk/Iron hawk attack aspect and we have travel aspects that are not normally of any use during PvE or PvP encounters. 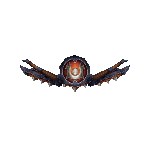 We also have an aspect we can glyph for: Aspect of the Beast. It would be a fairly simple matter to get rid of aspects; Hawk could be our default baked-in state and the remaining travel "aspects" could just be spells. There isn't a need to toggle off Hawk while in a travel state. This makes me sad. In the past, we had other aspects which made choosing an aspect meaningful. We had Aspect of the Fox. We had Aspect of the Wild. And long ago, we had Aspect of the Monkey. Aspect of the Wild provided a large amount of Nature resistance as an aura and had a PvE use in about 1/5th of boss encounters. Aspect of the Fox was short-lived. It allowed for casting many cast time spells on the move and provided greater focus regen. Aspect of the Fox wasn't successful as a design because people macro'd it into Steady Shot or Cobra Shot and then macro'd in a switch to Aspect of the Hawk before signature shots. This was a predictable automated form of "aspect twisting" and not in any way desirable, so it was retired and SS/CS were redesigned. Aspect of the Monkey was an early defensive CD hunters got long ago. You could flip to Monkey mode and it greatly increased your Dodge percentage. I believe hunter aspects are an interesting part of being a hunter, but they should be meaningful again. I believe aspects should allow a hunter to make a choice in their gameplay that doesn't require a re-spec or re-glyph, and which can be chosen while in combat. I believe aspects shouldn't be something that is switched to often and should be a manual effort, such that they don't make sense to do within any form of rotation or regular activity. Generally, I believe hunters should want to be in their normal Hawk aspect because when they are not, they should not be able to do as much damage. Each hunter specialization should provide access to one unique aspect to increase specialization identity. Glyphs affecting aspects should be changed. Level 45 talents should be tailored to improve a particular aspect. Only one aspect can be active at any time. And finally to reduce aspect twisting, there should be a minimum three second cooldown on changing aspects. Hunter aspects can be great. Below, I start with the basics and work my way up to the specialization-specific aspects. Your comments and ideas are definitely welcome. Party and raid members within 40 yards take on the aspects of a pack of cheetahs, increasing movement speed by 30%. (No daze effect exists anymore.) Imposes a 3 second aspect-wide cooldown. The hunter takes on the aspects of a hawk, increasing ranged attack power by 35%. (Not being in this aspect will greatly diminish your damage output.) Imposes a 3 second aspect-wide cooldown. The hunter takes on the aspects of a stealthy cat and becomes untrackable. (Previously known as the rarely used Aspect of the Beast.) Movement speed is reduced by 40%. If the hunter is under the effects of Camouflage, their movement is in stealth. (Folds a Glyph-for-only ability into a situational ability.) Imposes a 3 second aspect-wide cooldown. The hunter takes on the aspects of the natural interdependent web of life, increasing his and his pet's health regeneration by an additional 2% every 2 seconds. Imposes a 3 second aspect-wide cooldown. Party and raid members within 15 yards of the hunter take on the protective aspects of the turtle, reducing damage taken by 20% but also reducing movement speed by 40%. This aspect may be used until canceled, but has an activation cooldown of two minutes and imposes a 3 second aspect-wide cooldown. Available only to Survival hunters. The hunter takes on the aspects of a monkey, reducing the cooldown of Counter Shot by 12 seconds, increasing agility by 10%, and increasing dodge by a total of 10%. (The agility increase should always be worse than the Aspect of the Hawk RAP increase, including when under most proc effects.) Imposes a ten second aspect-wide cooldown. Available only to Beast Mastery hunters. The hunter loses themselves in their pet acting as one, taking on all aspects of the current pet, improving all forms of pet damage by 40%, and increasing run speed by 30%. If the pet dies, the hunter is stunned for five seconds. (The hunter mounts the pet like a vehicle and controls all pet abilities similar to the old spell Eyes of the Beast. Tenacity pet abilities like Taunt should work on bosses.) Imposes a ten second aspect-wide cooldown. Available only to Marksmanship hunters. The hunter takes on the aspects of an eagle, increasing ranged attack power by 50% but increasing all damage taken by 10%. (A glass cannon that will irritate theory-crafters.) Imposes a ten second aspect-wide cooldown. I haven't gone through all the changes and how items are being "re-balanced". (I'm still catching up on things since my vacation.) This affects the performance of my RPPM gear, the value of prepotting, and all the gems, reforging, and some enchants. In a nutshell, this is a rather huge change. Haste will not be as good. As you may know, RPPM proc rates typically scale with haste. This was done because historically, attacking faster meant you had more chances to proc something, so got more procs, and we wanted to preserve that effect. However, most procs before RPPM were such that either their effect didn't also scale with haste, or their proc rate was predominantly limited by an ICD. Many of our RPPM effects thus far have had neither of these limitations, such that they effectively 'double-dipped' on haste, benefiting twice from it. In some extreme cases, the proc was designed such that they actually triple-dipped. As RPPM effects have become more wide-spread and more impactful, this has caused a variety of problems. Primarily, it has skewed stat balances toward haste rather significantly. It's also a compounding problem where many of these procs stack multiplicatively with each other, causing insane burst when all of these procs go off together. That can be fun, but also raises the skill cap on your performance, and makes gearing choices more restricted to ones which stack together optimally. Flamekissed's proc rate scales with haste, and its effect says "Chance on hit: Deal 500 additional fire damage". This is fine, because only the proc rate scales with haste; the effect doesn't. Villainy's proc rate also scales with haste, and its effect says "Chance on hit: +5000 Agility for 20sec." This is not fine, because both the proc rate and the proc effect scale with haste. The more haste you have, the more attacks you do in that 20sec period which benefit from the increased Agility. If both the rate and effect of a proc scale with haste, we're going to remove the haste scaling from its proc rate. In these cases, we'll compensate for an expected amount of haste by increasing the base proc rate. For any procs whose effect does not scale with haste, their proc rate will continue to scale with haste as before. However, we're also revisiting the proc rate tuning on all existing procs that were made overbudget due to the addition of Unlucky Streak Prevention (which ends up increasing effective proc rate by 9%). These changes should bring RPPM procs back to being on-budget and tied with traditional ICD procs in value. This will obviously have a noticeable effect on most players performance; don't panic. We're going to be adjusting damage/healing/tanking performance with these changes in mind. 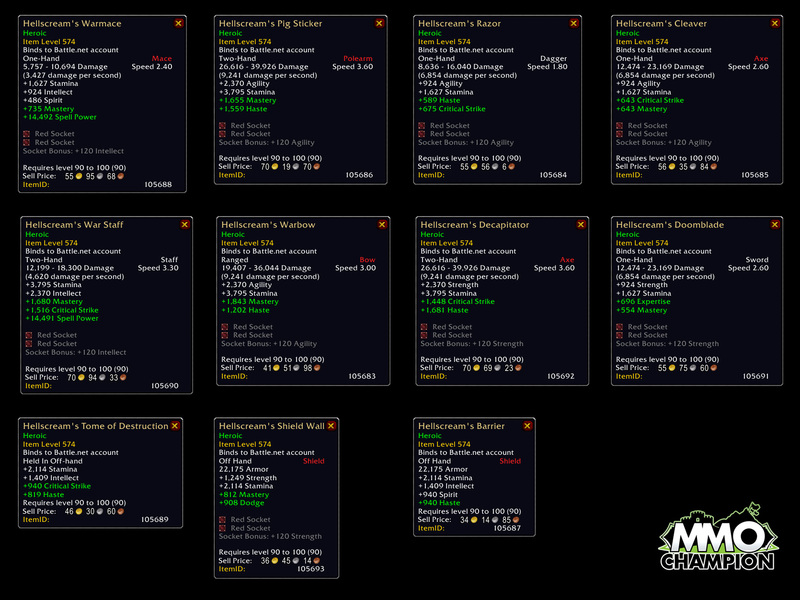 These RPPM changes should make it to PTR soon, and you'll be able to find the exact changes to each such effect there. We now show RPPM proc rates in the tooltip of the effect, which should make it easy to find. However, we recognize that not everyone likes the RPPM gameplay, and are going to greater lengths to provide alternative options in Siege of Orgrimmar. In addition to RPPM-based trinkets, there will be trinkets that use the older internal cooldown (ICD) method, as well as a few on-use trinkets if you'd prefer to have an even greater degree of control over when your trinkets are active. There's even a couple trinkets with completely passive effects. There is a BoA raid weapon drop with the horde graphic which drops off of Garrosh Hellscream. Yeah, BoA. MMO Champion has some indication that it may scale to character level 100. Then there are new "warforged" items and "flexible" items. Flexible corresponds to the new Flex Raid type. Warforged is the new label for Thunderforged. This one looks tasty... especially when upgraded to i580. I was traveling in England and Scotland the past two weeks. I put 950 miles on my rental car and my ability to drive on the left is pretty decent now. We were in various places in the Yorkshire region, Glasgow area, Inverness, and Edinburgh. I saw countless castles, pubs, abby ruins, gardens, Hadrian's Wall, tons of armor, melee weapons, and lots of ornate guns.